We're all still really liking this project! All this week Jack has been showing me more pictures he wanted printing off for his little scrap book, and sticking them in ever so carefully! 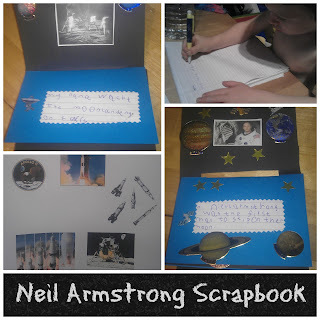 I talked with Jack and jogged his memory of what his Nana told him about watching the moon landing. As he remembered parts he wrote it down and I cut his writing out for him to stick into his scrap book, sort of in the right order. Then he went mad with sparkly planets and shiny stars, it looks so cute! I love reading his writing! At school he is encouraged to write phonically for now so seeing how he spells things is really interesting. He writes in his accent! But even with the scrap book making through the week the only thing on Jack's mind is painting his planets! 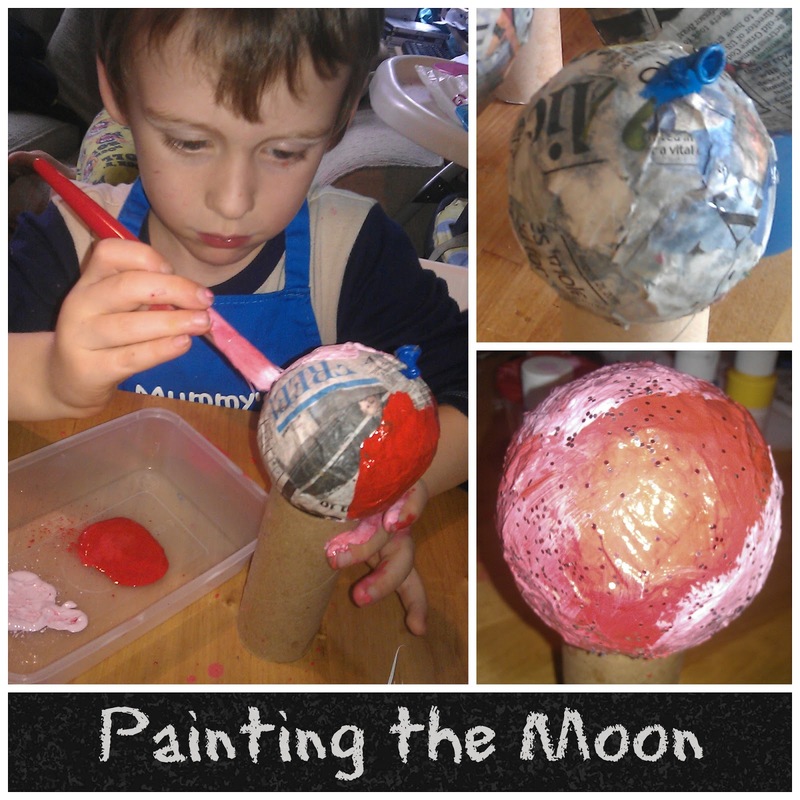 Unbeknown to the kids, most evenings we've been building up the layers of papier mache on the planets. They were a bit flimsy and they had run out of interest in layers of paper and glue so we felt we had to do something so they didn't collapse under the weight of the painting. The bigger planets still need a little work, but the little water bomb moons were ready to paint! 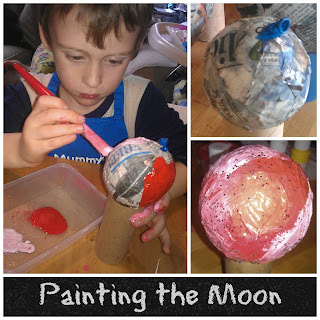 Jack wants his moon to be red and pink with moon dust. Tom painted his green with pink dots. They could do with a layer of varnish (or glue) to stop the glitter from dropping off, but they look fab! Jack's very proud!